When the US began to provide Military Assistance Program – MAP – vehicles to other countries, they found that in Asia there was a problem with the stature of the crews that would man these vehicles, and as a result they tended to only want to supply light tanks such as the M24 Chaffee or M41 Walker Bulldog. But as the threats began to grow and the “other side” got vehicles like the Soviet-built T-54 and T-55, and later the T-62 and other heavier vehicles, heavier tanks needed to be provided to deal with the threat. The other main problem was the fact that the infrastructure in most of the countries – South Korea, Japan, South Vietnam, the Philippines, Taiwan, and Thailand – would not support heavy armored vehicles. The Republic of Korea Army had worked its way up to the M48 series of tanks, but these tended to strain the crews when it came to maintenance as well as the infrastructure. As the US Army prepared to field the M1 Abrams, it did not look that it would be suitable for use by the ROK Army. Therefore, in 1980 the ROK Government asked General Dynamics – developer of the accepted version of the Abrams – to design a new tank to meet its needs. The tank, dubbed XK-1, looked much like a scaled-down M1 with the same armament of a 105mm rifled gun, 7.62mm coaxial machine gun, 7.62mm loader’s machine gun, and 12.7mm antiaircraft machine gun, but weighed 10 tons less and was smaller in overall dimension. Type classified as the 88 Tank (“Type 88" in the West) it entered production in 1984 with Hyundai in Changwon. 883 battle tanks were built along with AVLB and ARV variants and serve with both the ROK Army and ROK Marine Corps. Later, as the threat for the ROK Army evolved, a new version of the tank was designed and accepted for service in 2001 as the K1A1. It is again smaller than the Abrams (an M1A1 holds 40 rounds of 120mm ammunition, the K1A1 only 32) and weighs 54.5 short tons against the nearly 69 tons of a fully loaded Abrams. The K1A1 uses an external hydraulic suspension on stations 1, 2 and 6 that can “kneel” or “rise” instead of the torision bars of the M1A1 (which it appears to use for stations 3, 4, and 5). It uses a German MTU 871 engine of 1200 HP instead of the Abrams’ turbine. Protection levels are not given but it is assumed to be immune to the 115mm and 125mm guns known to be in the DPRK Army inventory. Assembly is pretty straightforward and conventional in layout. Details are crisp and well done, with clear sections provided from a small sheet of styrene for the gunner’s and commander’s sight heads. The M2 type machine gun (the ROK version is a K6) consists of 11 parts but the receiver is split down the middle and the ammo box has no floor, so it is a seam and some scrap plastic to fix them. All of the personnel hatches are positionable as are the external machine guns and the gunner’s sight doors. The bustle rack is composed of 12 parts, but they looked to be relatively seam-free and only require a bit of touch-up filing. The K1A1 has bins around the outside of the turret and the bustle attaches to them. The model also comes with two figures, a 3/4 length commander and a loader with a choice of CVC helmet or beret. He is full size and may be posed outside the tank; both figures come with a camouflage coverall uniform. A nice sheet of decals comes with the model, but for some reason there is NO mention of them on the finishing instructions! The model is shown finished in ROK Army version of what the US Army calls the MERDC “Winter Verdant” scheme of dark green, field drab, black and sand. The decals provide what appear to be two divisional insignia (one being the famous “Tiger Division”), a banner of some sort, and four sets of stripes in red, yellow, blue and white. 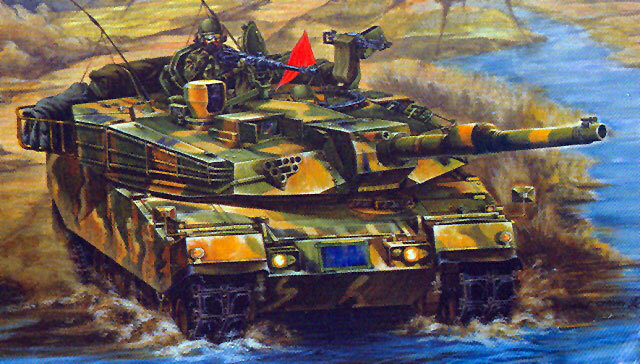 Alas, the box art is not much help as it shows a K1A1 fording a small stream while firing and wearing what appears to be “Blue Force” exercise markings. Overall this is not a bad model; even though the design seems to be somewhat of a throwback to the “old days” of no brass and fewer parts the details are not bad and many modelers will probably appreciate the chance to put a model together without an engineering degree being a prerequisite!